How special are our musical friends? THIS SPECIAL! Maybe they’ll play Stay Alive Five if you ask them nicely. 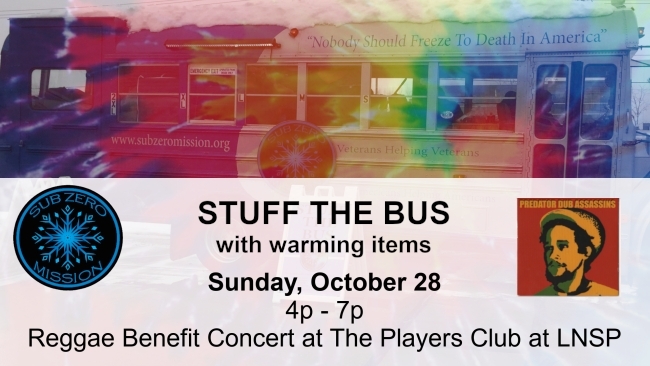 Come listen to some island-style reggae as we say good bye to the summer by helping the homeless stay warm this coming winter. The event will be held at The Players Club, which is a fun, upbeat, and roomy 6,000 square foot party hub right in the heart of the Lost Nation Sports Park. 3 full stocked bars with 10 taps!!! Bring your appetite along with your warming goods, as the menu is delectable!!! This is a FREE event, but some hats, coats, gloves, boots, sleeping bags or other warming items would be your best ticket to get in. 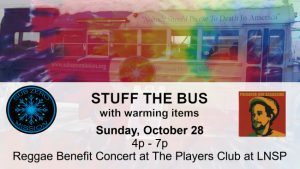 We are collecting our Stay Alive Five at this event: Players Club at Lost Nation Sports Park Sunday, October 28 from 4 PM to 7 PM.